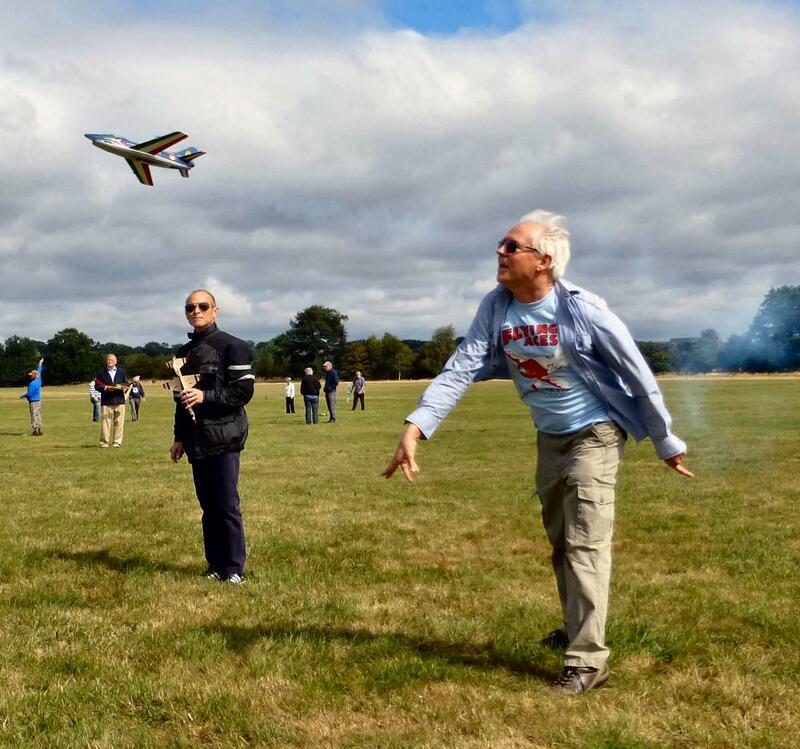 "The Jetex/Rapier contest entertained us all day (you can’t miss it, much fizzing, smoke and general running about) and Roger Simmonds (MIG 15) took the Authentic Scale category with another of the Flights of the Day . In Profile Scale, all ten entries put in flights, R.S. scooping the pool in what was arguably the most hotly contested event on the field. The Ducted Fan event went the way of Ian Lever’s excellent KK MIG 15, converted to D/F". 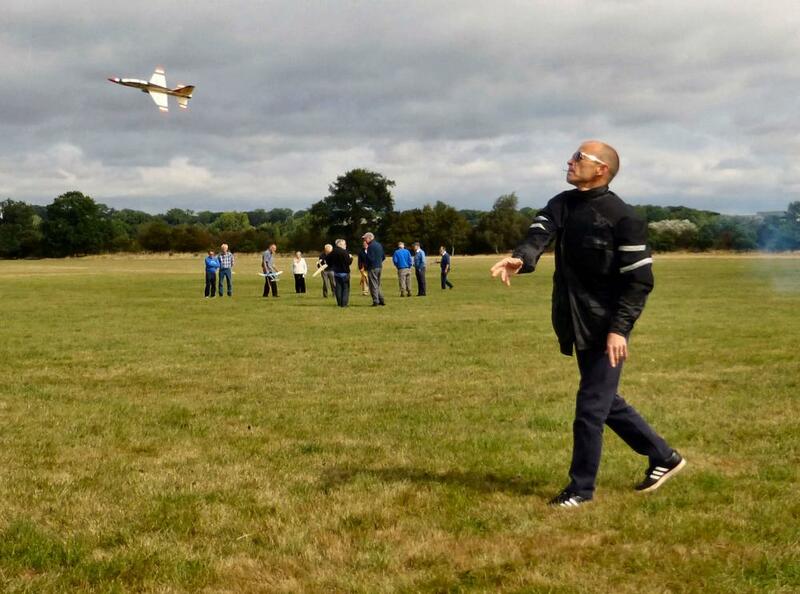 One of the flights of the day, mentioned by Brian Lever at prize giving, was by Roger Simmonds, from whose vaporous environs, Jetex and Rapier models flew exhaustively, throughout a difficult day. Flying Aces sees as large a collection of jet and Ducted Fan jobs as you are likely to see anywhere". John also sent me this photo. As I wrote earlier, it was worth waiting for a slight lull in the wind. The MiG 15 behaved well with a rather more powerful Rapier L-2 than I usually recommend for this classic design. Roll on our next meeting at Old Warden where we hope the weather will be kinder! 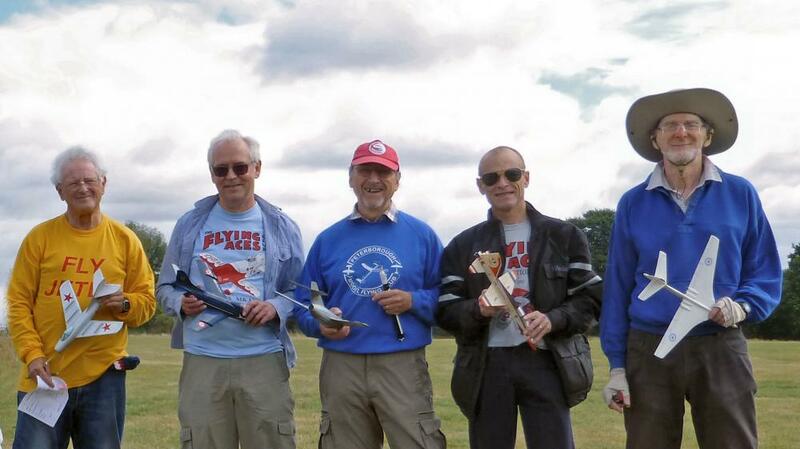 Mick Page of the Peterboro club has sent me these photos of intrepid jet flyers. Above: from the left: Chris Richards, Mike Stuart, Roger Simmonds (me), Andy Blackwell and Howard Metcalfe. We all look happy just to be there and get some flying done! 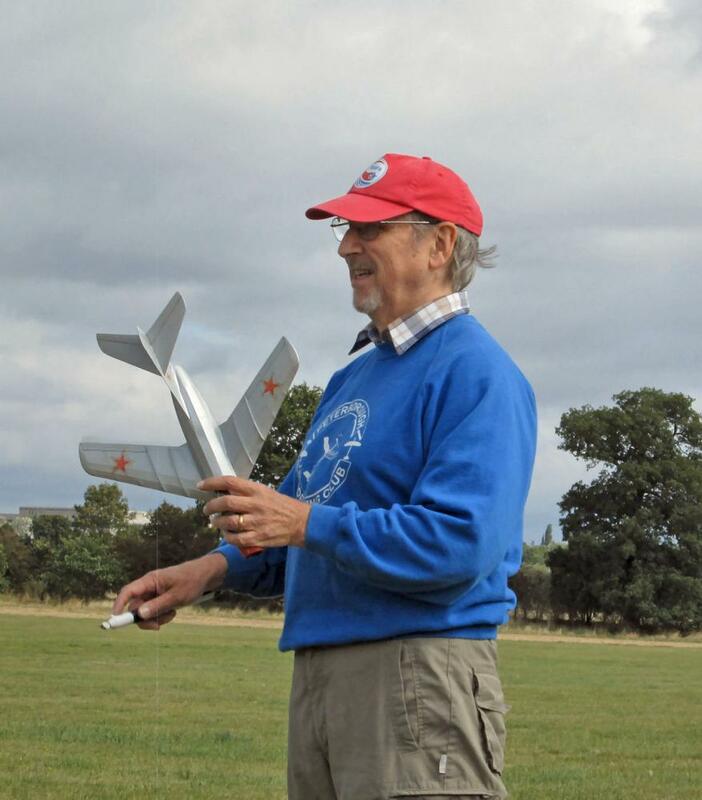 Above: the indomitable Chris Richards with his EDF MiG 15. Above: Mike Stuart launches his well flown Fiat G-91. Above: Roger Simmonds going for gold. Too steep a launch, but it did recover. 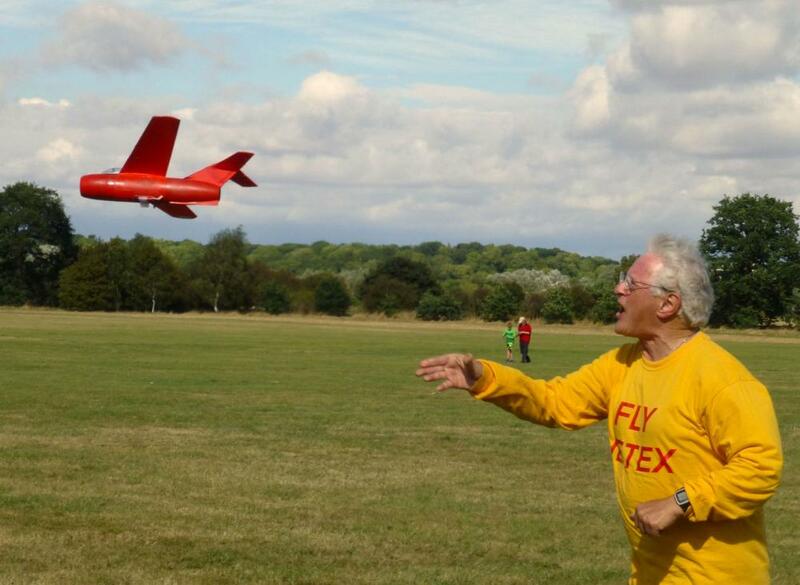 Above: Andy Blackwell launches his new T-38. It looked good climbing away but never quite recovered from the turn. 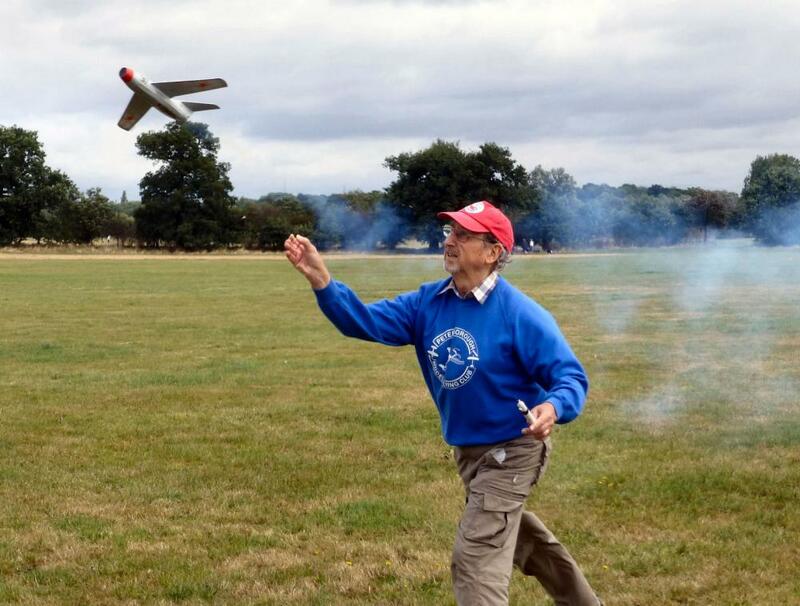 The three flights of Howard's Swift at about 2 min 30 sec are inspirational!